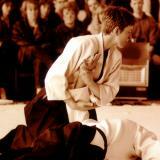 Aikido is a Japanese martial art that focuses on defence and communication. We study self defence in its wider sense, from physical locks and throws, dealing with grabs and strikes and learning about posture, balance and co-ordination to exploring the qualities of calmness, assertiveness, awareness and compassion. We learn how the mind and body can work together effectively, both in and outside the Dojo. 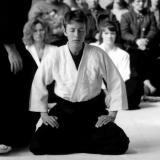 We have been studying and teaching Aikido for longer than we have been running our business, for more than 25 years. To us it is much more than a hobby, the practice of ‘the way of harmony with the Universe’ (as Aikido translates) is the continual thread running through the way we live, and was a powerful force driving us to seek a better way to work too. We usually teach classes upstairs from Dojo EcoShop in the Aikido Dojo which is a fully matted practice space. Whilst our EcoShop is closed for refurbishment all classes are at the Manchester University Sugden Sports Centre. 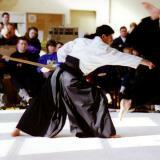 The classes are open to everyone, from beginner to black belt and everybody is taught at their own level. There is a very friendly atmosphere with a wide range of ages and abilities, if you want to know more just give us a ring on 01938 552617 or come along to any class. Senseis Jonathan Davies and Sarah Williams, 5th Dan, British Aikido Board Senior Coaches, Principal Coaches of the Keitenshin Kan.